I was contacted just before Christmas to see if I wanted to try Curology. This was the first time a company that was already on my shortlist has contacted me for a product review. I was very exciting indeed. I'm very picky about the reviews I do, so I hope the medical providers at Curology can handle this fussy baby. I started a free 3-bottle/3-month trial in late winter. The process is very simple, and if you're like me and love talking about every little flaw on your face + your exhaustive skincare routine, you will relish it. 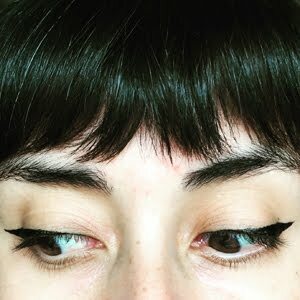 I filled out a profile, including details on different prescription treatments I've used, the other products in my routine, and my very *special* skin's eccentricities. The questionnaire allows gives you the freedom to yammer on as much or as little as you like. If you just want a perfunctory "consult," you can do that to. After the questionnaire, the system requires that you upload 3 pictures of your face, plus any additional images of problem areas. Unfortunately, this trial caught me in very clear portion of my skinlife. I contemplated smearing butter on my face the night before just to give my provider something extra juicy to diagnose. Instead, I uploaded some boring acne selfies, but did my best to show every pore in my nose and bump on my chin. After 1 day, I received a message from my Curology medical provider (mine was a PA-C / Certified Physician Assistant). I then requested a change to the proposed formula because, I told y'all, I'm a fussy baby. 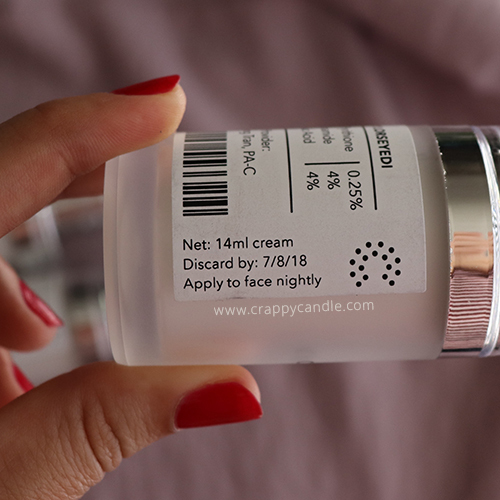 I received my first bottle within 1 week of completing the questionnaire and started my new routine that evening: 2 days Curology at night, then 1 day Tretinoin at night. Business as usual in the morning. 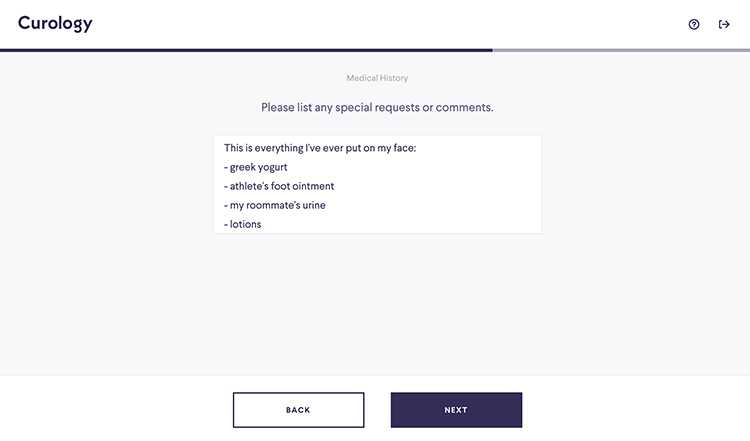 The questionnaire/quizzle will ask about your skin type/concerns/goals and your medical history, including topical and oral treatments you've tried, potency, and how you liked each one. Be sure to include any additional information your medical provider may find useful. Submit your quizzle, see the Curology medical provider they've assigned you, and submit your contact info. Upload your selfies, then wait approximately 12-24 hours. Haggle with your Curology medical provider. Get your revised "prescription" from your Curology medical provider and approve it. Wait about 1 week and receive your very special package for your very special skin. Follow the instructions provided for your new routine. Wait to see if your new routine is working. Pester your Curology medical provider with pedantic questions in the meantime. Ok, I'm going to briefly discuss the merits of each active ingredient in the formula I tested: Niacinamide, Zinc Pyrithione, and Azelaic Acid. 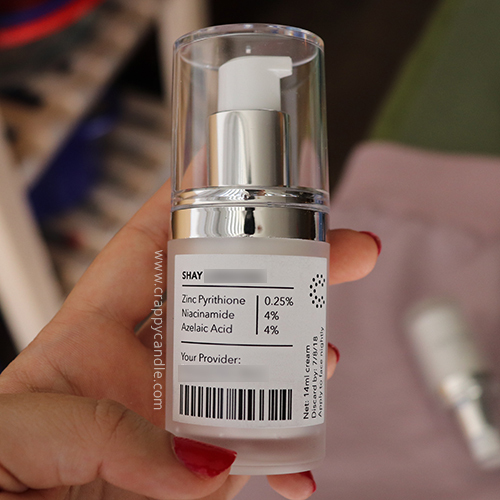 Niacinamide is an easy one: it's a cell communicator used in a ton of over-the-counter and prescription acne & anti-aging products. Many, myself included, consider it a "gold standard" skincare ingredient, so we're all good here. The newbies for me were the other two. Zinc Pyrithione is commonly prescribed in acne washes and creams. Its anti-bacterial / anti-fungal / anti-inflammatory properties make it ideal for treating acne and perioral dermatitis (which I'm also prone to). You may have seen people recommending treating acne or POD with dandruff shampoo — well Zinc Pyrithione is the reason (it's the active ingredient in Head and Shoulders). Keep in mind, Zinc Pyrithione is distinct from Zinc Oxide, which is a key ingredient in physical sunscreens. Azelaic Acid is the newest rock star skin acid that is going to be everywhere in the next year or so. It's it can improve/brighten skin tone, has antioxidant properties, and is great for treating acne + irritation. Oh, and it may also treat perioral dermatitis. It is available via prescription as Finacea (no generics yet) and over the counter from The Ordinary and Paula's Choice. I have not tried any of these other products yet, so I was super excited about getting to test it here. As I mentioned previously, I was using 0.1% tretinoin while testing this. My PA said I should do two days Curology, one day tretinoin, and so on. The cream itself does not leave me oily at all. I believe the zinc helps with this. About halfway through the first week, I noticed some mild burning on my face about one hour after applying Curology. I applied more moisturizer on top, hoping it was just my imagination. By week two, I figured out that applying the moisturizer prior to applying Curology stops the burning. I gradually switched back to the usual order with little fuss, so I didn't tell my PA about it. At the beginning of Month 2, my POD-prone chin started looking terrible — I had some little bumps, redness, and a few proper zits. Because I'm using both an exfoliant and a retinoid, it could be that I'm overloading my skin. My PA said that it could be purging (I was not using the tretinoin on my chin prior to this), however, I've also noticed a ton of blackheads on my cheeks. It's not encouraging, but also not too noticeable. I push forward. At the beginning of Month 3, I'm not seeing a huge improvement in my zit production. It's about the same as it was before I started the trial. I've started folding in some of my old products (Paula's Choice toner & serum) and have become more dutiful about morning face rinsing. By the end of the month, I've switched to my old tretinoin routine (every other day), using Curology on the off days. This "every other day" routine has proven to be much better for me. I wash my face at night with water and a wash cloth, then wait at least 30 minutes before applying either treatment, followed immediately by my moisturizer. I rinse my face in the morning, and sometimes add a toner, serum, and/or an SPF to the mix. I'd say the overall redness on my face improved slightly, as did my skin tone and dark spots. My perioral dermatitis did clear a bit, although I may have caught it in a low month (it's creeping back currently). 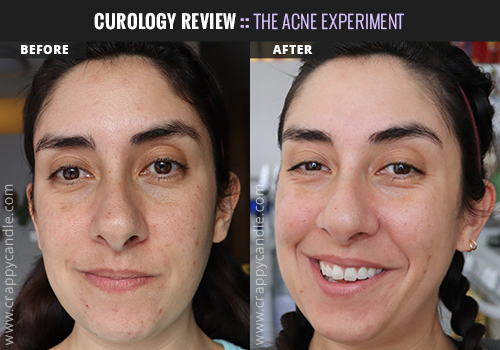 I attribute these improvements not only to the actives in the Curology formula, but also to restoring my original tretinoin routine. The latter was key for maximum improvements for me. So, if you're trying Curology, be sure to work with your medical provider to tinker with your routine. What they first propose may not be ideal for you. 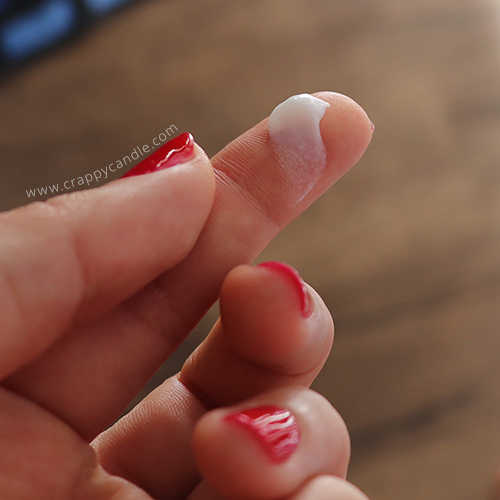 As for drawbacks — I still periodically experience burning after applying Curology, but it's not extreme. On those days, I'll sometimes see some mild peeling the next morning, but a quick rinse takes care of the flakies. I assume it's the azelaic acid that's doing this, but the benefits I've seen outweigh these side effects. At the time of of writing this, I had just opened my 3rd small bottle. At this rate, my "3-month" trial will last for 8 months. I plan to use this stuff 'til it's gone. I had a good enough experience with the service/product to consider re-upping the subscription down the road, especially if my skin takes a dive after I finish the final bottle, and especially if I ever lose access to my precious tretinoin. Curology confirmed with me that they offer up to 0.14% tretinoin formulations. All Curology formulations contain the same inactive ingredients. This may seem scary, but consider this: You don't have much control over the inactive ingredients in the topical prescriptions you get from a conventional doctor either. Unless you know you have an aversion to a specific ingredient, I wouldn't worry about it too much. As for the actives, Curology has a specific formulations they prescribe. I know this because when I asked to have clindamycin switched out for azelaic acid, my PA said there was only one formulation that they have for that (i.e. the specific ratio of azelaic acid/niacinamide/zinc I was prescribed). 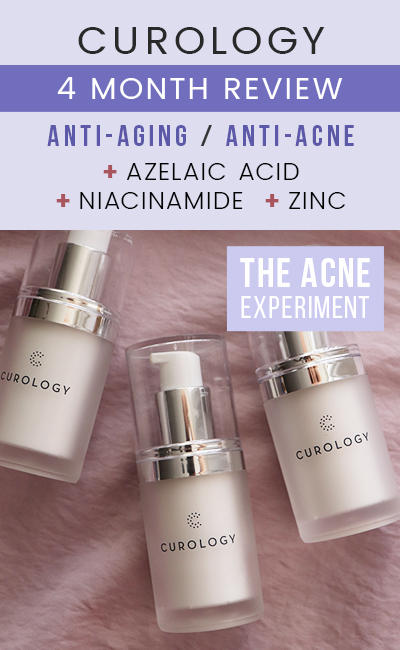 So, you won't be able to go in and say, for example, "I want 20% azelaic acid, 30% vitamin C, and 0.1% tretinoin," because 1) that probably isn't a formulation they offer, and 2) that's crazy, you'll burn your face off. Curology bottles have what is called an "airless pump" meaning you can't just unscrew the top and scoop out product when you're running low. On their website, it says that if a bottle stops pumping out product, you should put the cap on, turn it upside down, and tap it a few times on a hard surface. I was skeptical, but I tried this with my 2nd bottle. I must have gotten another 2 weeks out of that sucker. Once the ol' cap and tap is exhausted, you can then unscrew the pump and use a q-tip to get out anything that remains in the teensy reservoir. You should be able to get about 1 application out that way. Just don't unscrew it prematurely as it can expose the product to air and mess with the pump. 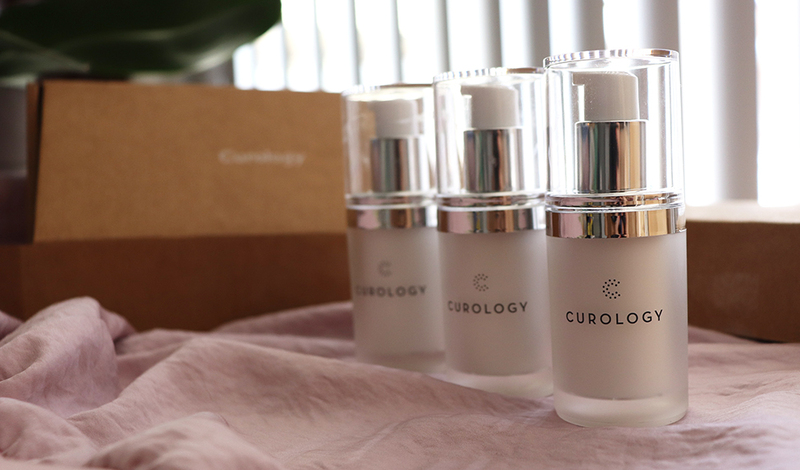 Curology is a subscription service, but you are only charged when a bottle ships: $24.90 for the small bottle ("1-month" supply) or $39.95 for the big one ("2-month" supply). Either plan can be suspended, meaning you can order a bottle and put the next bottle on hold until you need it — and you won't get charged so long as you're on it and actually delay the shipment. Set reminders in your phone y'all. If you're new to Curology, the first month, i.e. your first small bottle, is free . I suppose once you have a routine nailed down, it makes the most sense to order the bigger bottle and adjust the shipping frequency to your needs. At that time, your monthly cost could be significantly less than $19.95/mo. For example, for me, I would be spending anywhere from $13.30/mo (if I'm using it daily) to $6.65/mo (if I'm using it every other day). Each bottle you get comes with a "Discard by" date printed on the side. Every bottle I received had a date that was only a few months out from when I received it. Since I was taking longer to go through a bottle, I asked Curology about this. They said these are the dates in which they can guarantee, based on lab testing, 100% potency of the active ingredients. They gave me a very vague response as to how potent it would be past that date. Personally, I've used my prescription creams well past expiration dates without issue, so I wouldn't worry too much about the date. I'd imagine the decline in potency is more gradual. The pumps are airless, which should help with preservation, plus the inactives do contain preservatives. This is not a fragile natural product, y'all. If expiration dates are a concern, you can delay shipments of future bottles so they don't start piling up. Also, if it takes you awhile to get through a bottle, you could opt for the smaller one so you can use it all up before it "expires."